Pranitha, A., Lakshmi, P. (2014). Towards a Correlation between Polar Surface Area of Drugs with Ex-vivo Transdermal Flux Variability. Iranian Journal of Pharmaceutical Sciences, 10(2), 47-60. Akula Pranitha; PK Lakshmi. "Towards a Correlation between Polar Surface Area of Drugs with Ex-vivo Transdermal Flux Variability". 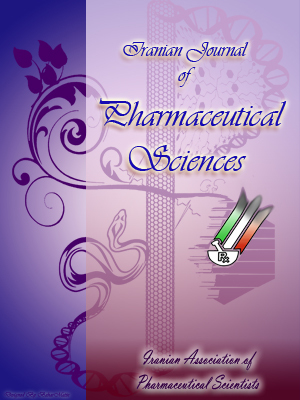 Iranian Journal of Pharmaceutical Sciences, 10, 2, 2014, 47-60. Pranitha, A., Lakshmi, P. (2014). 'Towards a Correlation between Polar Surface Area of Drugs with Ex-vivo Transdermal Flux Variability', Iranian Journal of Pharmaceutical Sciences, 10(2), pp. 47-60. Pranitha, A., Lakshmi, P. Towards a Correlation between Polar Surface Area of Drugs with Ex-vivo Transdermal Flux Variability. Iranian Journal of Pharmaceutical Sciences, 2014; 10(2): 47-60. Department of Pharmaceutics, G Pulla Reddy College of Pharmacy, Mehdipatnam, Hyderabad, Telangana, India. The aim of the present study was to investigate the relationship between the polar surface area and other molecular properties of the model drugs and their transdermal permeability across the rat skin. Few model drugs which are weakly acidic (ibuprofen, aceclofenac and glipizide) and weakly basic (olanzapine, telmisartan and sildenafil citrate) were selected for the study based on Polar surface area (PSA). Ex- vivo studies were carried out in franz diffusion cell. The skin permeation parameters of the model drugs were correlated to the physicochemical properties. The physicochemical properties considered for the study have shown to be synonymous with the pre-established ideal properties for the transdermal permeation. In acidic drugs, the order of correlation of the physicochemical properties to flux was mol. wt. > total no. of hydrogen bonds > M.P > PSA > Log P > Log D > solubility. In basic drugs, the order of correlation of the physicochemical properties to flux was mol. wt > PSA > solubility > log P > log D> total no. of hydrogen bonds> M.P. The property considered for the study PSA has acquired 4th rank in acidic drugs with R2= 0.9465 and 2nd in basic drugs with R2= 0.9477. The prime important factor for the study PSA, has shown a tortuous effect on the permeation of the selected drugs, whereas further study of PSA in relation to skin permeability parameters by considering larger drug data sets may impart a clearer image of its influence on transdermal permeation.